micah (Micah Cohen, politics editor): Greetings, people. Today we’re going to have a super nice and respectful chat about a recent column from David Brooks of The New York Times. micah: The column: “The End of the Two-Party System.” Can someone give us a fair summary of Brooks’ argument? natesilver (Nate Silver, editor in chief): The summary is that we need the Reasonable Center Party, which happens to have exactly the same policy positions that Brooks has and would be enormously successful if only anyone bothered to create it. clare.malone: Brooks brings up the rise of basically what he’s categorizing as tribal politics, and compares it to European trends from the late 1990s and early 2000s. He says that, at some point, conservatives and liberals will split themselves between true philosophical conservatives and liberals, and then the people who are the tribal conservatives and tribal liberals. perry (Perry Bacon Jr., senior writer): A more generous summary might be that Brooks feels the Republican Party is too Trumpish and the Democratic Party is too stuck on race- and gender based-politics, and we need another party for people who don’t like those two ideologies. There’s a ton wrong in this article, right? natesilver: I mean, the main problem is that he doesn’t understand how parties work. Which is a pretty big problem if you’re writing a column about parties. I like Brooks, by the way (I really do) — this just wasn’t one of his best efforts. perry: So, first, he points to the good old days of the 1990s. But as Julia Azari has written, we’ve always had very intense political conflict, it’s just more partisan now. Moreover, the 1990s were not great — as we knew back then but are learning more now — if you were, say, a woman trying to advance in many fields or an African-American who dealt with the criminal justice system. Second, the pre-Trump Republican Party he describes skips over the racialized politics of, for example, Richard Nixon and Ronald Reagan. In the years after Ronald Reagan, the Republican Party was defined by its abundance mind-set. The key Republican narratives were capitalist narratives about dynamic entrepreneurs and America’s heroic missions. The Wall Street Journal editorial page was the most important organ of conservative opinion. The party’s views on other issues, like immigration, were downstream from confidence in the abundant marketplace and the power of the American idea. What about all the racialized law-and-order stuff? clare.malone: My real problem with the article is that he doesn’t really prove his case. micah: But, Nate, explain how you think the article misunderstands how parties work. natesilver: Du. Ver. Ger’s. Law. OK, that’s a pretty obscure reference. But its point is that party systems are heavily influenced by electoral structures. You usually get two major parties, or maybe three, in first-past-the-post systems like the U.S. uses. Those European systems he’s talking about — where you have lots of viable parties — mostly have proportional representation. It should really be “Duverger’s reasonably reliable empirical regularity” and not “Duverger’s law,” but it’s a pretty useful heuristic. My question is, when does Brooks think all of this is going to happen? That is, is this something he thinks will come down the pike in 2020 (aka, David Brooks is a stan for Kasich 2020)? Or is this something 25 years in the future? natesilver: It will happen once more people read his columns and join the Reasonable Center. Isn’t his argument like: People are getting really partisan and so therefore people will break out of partisanship? Or am I misunderstanding the argument? natesilver: It’s not necessarily wrong to think that partisanship could abate. It does tend to ebb and flow. And it’s at a high end of the historical range now. clare.malone: It’s really hard to build a party structure — state-level offices/organizers/money — which is one of the reasons that people tend to stay within the two major parties. Like, if you wanted to launch a legitimate third-party bid, it would not be something that could happen overnight. The Libertarian Party has been trying for decades, and they’ve only recently been racking up margins that made a dent. 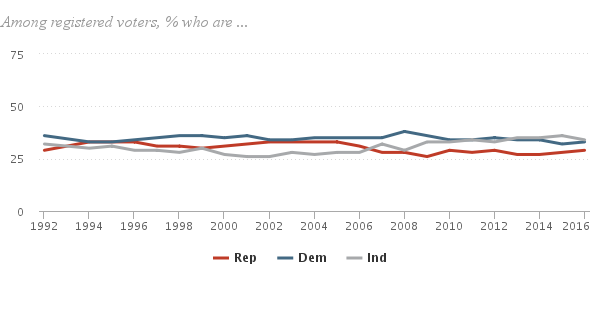 natesilver: And/but/also, the two-party system is pretty adaptable. Does the Republican Party under Trump look a lot different than the Republican Party under Reagan? Sure. But that’s why parties work! clare.malone: Right. Parties shift priorities. The modern Republican Party emerged under Herbert Hoover. So maybe it won’t break apart now, it’ll just shift to a new iteration. perry: I was thinking out loud about this before the chat, but the last new, big major party in America was in the 1850s, right? Lincoln’s Republican Party. It replaced the Whigs in many ways. Trump’s rise is a major crisis to Republicans like Brooks and lots of other scholars who view Trump as kind of the worst possible type of president. So the idea is a Gov. John Kasich-like figure rises to create a new kind of party that is an alternative to Trumpism. I didn’t think that was impossible in October 2016. But it seems much more implausible now, since Republican voters broadly like Trump and it’s not clear that stopping Trump is some clarion call for people outside of the Democratic Party and the Acela corridor. micah: Yeah, so that’s key: Is there demand/desire among Americans for a third party? micah: But that’s party identification … people do say they want a third party! perry: I think there’s demand for changes in politics: a more populist economic strain and a more nativist strain. But it feels like the former is happening in both parties (Trump, Bernie Sanders) and the latter in the GOP with Trump. natesilver: Yeah, exactly. Basically, Brooks is a Democrat now and doesn’t want to admit it. micah: Explain that Gallup chart though. clare.malone: I do think it’s fascinating that Americans say they want a third party. And yet … where is it? Maybe if the U.S. had less money involved in politics, you’d see more parties. natesilver: I wrote something once about how Trump himself was essentially a third-party candidate. His platform during the campaign was quite different than John McCain’s or Mitt Romney’s — although he has arguably governed as a much more traditional Republican. But part of the issue that Americans don’t want a third party — they want their third party. Yes, third parties in American politics are kamikaze missions. Because of our single-winner plurality system of elections, third parties almost never gain representation. And yes, a serious third-party conservative challenge to Republicans would help Democrats in the short term, by siphoning off votes from Republicans. But each month that the Republican Party has a leader who can’t conceal his overt racism, who calls the media the enemy of the people, is a month in which voters who identify as Republican have to update their worldview to fit with their partisan identity. Only losing, and losing bigly, will break this Republican partisan trajectory. Perhaps you like the idea of starting a Conscientious Conservative Party, but don’t like the idea of losing and tipping the balance of power decisively to Democrats. In that case, maybe you could get on board with changing electoral laws to make it easier for third parties. Perhaps you could get behind the Fair Representation Act, introduced last year in the House, which would move us toward a proportional voting system by creating multi-member districts with ranked-choice voting. That means that even if the Conscientious Conservative Party could only get about 15 percent nationally, it would get some seats in the House — possibly enough to be a pivotal voting bloc for control of the chamber. Or if that feels too bold, how about just straight-up ranked-choice voting, which would give people the chance to vote for the Conscientious Conservative Party and then list either the Democrat or the Republican as their second choice, ensuring that they could express their true preference without wasting their vote, and putting some pressure on both Democrats and Republicans to court Conscientious Conservatives to earn their second-choice votes. The point is, third-party votes don’t have to be wasted votes. They’re only wasted votes because our electoral system makes them so. natesilver: Yeah, look, I don’t want to go overboard in totally dismissing the idea of a third party. Also, independent presidential candidates can sometimes succeed irrespective of a more sustainable third party. But as Perry says, a lot of the changes happen within parties. And independents fall into maybe three different categories — including lots of people on the “far left” and the “far right,” not just Reasonable Centrists. micah: No one has yet explained to me what gives with that Gallup chart, though. 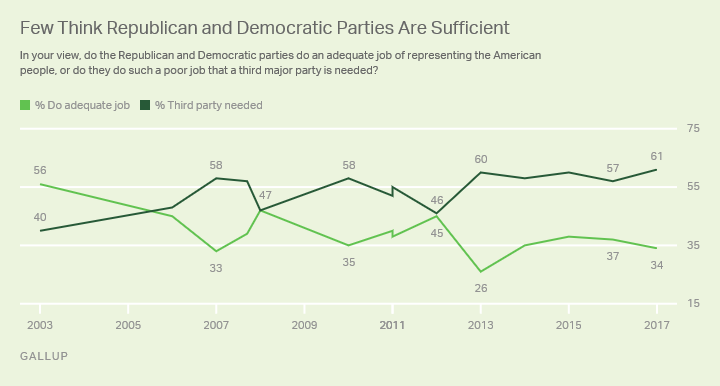 If 61 percent of people think a third party is needed, what’s getting in the way? Brooks is speaking for the masses! clare.malone: I mean, there’s no high-profile candidate from a third party. Jill Stein and Gary Johnson are too fringe. And their parties don’t have enough money. So no one except people who read sites like FiveThirtyEight ever vote for them. micah: Don’t stereotype our readers! micah: Let’s do a poll. Have you ever voted for a third party? Anyway, how could we get more parties? Structural change, as Drutman wrote? perry: I think so — it’s the structure of our electoral system that gets in the way. natesilver: Yeah, see, Brooks should really be writing about the need for ranked-choice voting. You’d probably wind up with slightly more fluid, centrist parties, although maybe not with more parties. perry: Well, the parties would have to vote for structural change, and I don’t see that happening. I think I could see an Emmanuel Macron-style situation happening in the U.S.
clare.malone: Macron is basically a Michael Bloomberg type but with less experience. Way less. perry: If, say, Sanders and Trump are the nominees in 2020, could the Reasonable Centrist Party do better? Macron is a centrist in policy but has a personality cult around him. Or had one. clare.malone: I mean, if Sanders wanted, he could lean into the Democratic Socialist Party thing and try to build that out. It probably wouldn’t yield him the presidency in his lifetime, but it would perhaps bear fruit decades down the line. A delayed-gratification legacy. micah: Sanders doesn’t seem the type for delaying gratification. perry: Take Arnold Schwarzenegger in California in that very odd California 2003 environment. I felt like he could have won as an independent. natesilver: But in the case where Sanders has won the Democratic nomination, he’d look like a more “traditional” Democrat by the time the general election rolled around. And the Democratic Party is moving in his direction anyway. clare.malone: Right. Sanders realized that you need the big party in order to succeed. Even if you hate their guts. natesilver: Could someone more radical than Sanders win the Democratic nomination? Maybe. Or a Sanders who also had lots of personal liabilities? micah: OK, so if we all think that it’s much more likely that one of the two major parties will shift in a big way than that a third party will emerge, what could that shift(s) look like? perry: Those shifts already happened to some extent. And the people who lost out on the them are the Jim Webb types in the Democratic Party and the Bill Kristol/Brooks types in the GOP. micah: One hundred percent agree on GOP, but are we really ready to declare the Democratic Party fully shifted too? In other words, is asymmetric polarization more symmetrical now? natesilver: Neither party has fully shifted, but the Democratic Party is earlier in its process of shifting, I think. perry: I’m just having a really hard time seeing the Kristol/Brooks wing retaking the GOP. I think, like Nate said, those people are basically Democrats now. And they should try to push the Democrats to be less-identity-ish. micah: So, yeah, you two just identified the tension there, right? clare.malone: Big ol’ tent, huh? Big enough for Brooks and Kristol. micah: It would have to be a huge tent! Brooks describes the Republican Party of the 1980s without one mention of race — getting Brooks-esque voters in the same tent with liberal Democrats is gonna be tricky. clare.malone: I mean, those guys are basically European conservatives, to go back to the Brooks point about European politics. And their being in the party for a while could, in 10 years, push the more left-leaning people to start their own thing. Eventually the tent will get too crowded and some people will have to go to the overflow section. natesilver: Right now, opposition to Trump unites white urban neo-liberals with white democratic socialists with black and Hispanic voters. You’d have a lot of tensions within that coalition down the road, though. perry: Brooks and the other conservative anti-Trump voices have resonance, in part, because some Democrats at the elite level are wary of the identity stuff too but can’t say so publicly. (Let’s say Sanders and Biden, if you look at their immediate post-election comments.) But I think a party that is only about 25 percent white men doesn’t really care what Brooks thinks. The Democratic Party is going to get more Sanders-like, I think, in the short term. And this is going to frustrate people like Brooks, who should become Democrats. But could Biden win the 2020 nomination on a kind of unity platform? Maybe. It feels like Brooks’s best hope is that the Democratic Party, in some kind of “Save America from Trump” move, embraces a style of politics that Jeff Flake, John McCain, etc., agree with but does not piss off young voters, minorities, women, socialists, Sanders types. In other words, the parties really sort along immigration lines — the people with Trumpish views on race/immigration in one party, the others in a second party. 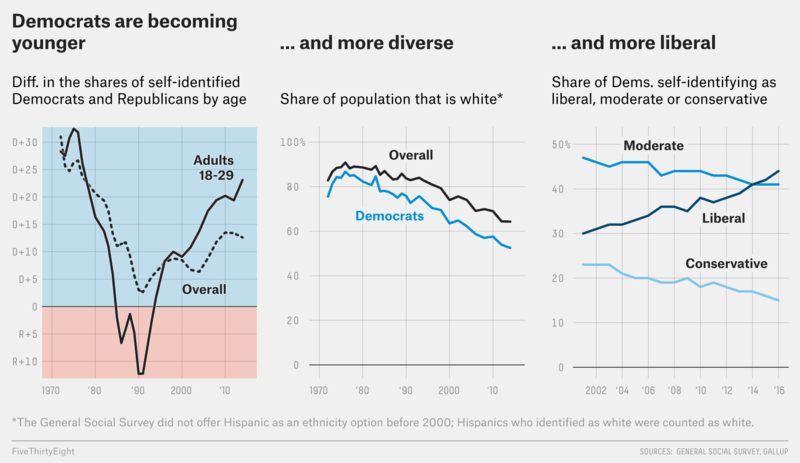 natesilver: Obama, in some ways, united all these different groups together in 2008 because George W. Bush was so unpopular. So if Trump is really, really unpopular by 2020, a Biden type could do great. In the long run, I don’t think you can avoid these tensions, though. perry: That’s a great point. The 2008 Obama campaign was a kind of unity ticket. He couldn’t recreate that in 2012.
micah: OK, and to wrap up: Is there any chance that the Republican Party becomes the party Brooks wants it to be? clare.malone: That’s a negatory. At least in any sort of near-term future. I don’t think you can just forget about the forces in the party that manifested Trump. perry: If Trump and Putin had a July 2016 phone call during which Trump told him to hack Podesta’s email, that call becomes public and Trump is impeached and removed from office … then maybe. micah: See, I disagree with that, Perry. perry: You think Putin made the hacking suggestion first? The Trumpism in Republicanism predates Trump and — to a first approximation — would postdate him too, wouldn’t it? micah: So, if Trump loses re-election, Republican primary voters suddenly move to the middle on immigration? micah: Whose team are you on, Clare? clare.malone: I’m not sure about my team. I guess I could see, in the case of a Trump flameout, Trumpians getting completely steamrollered by national establishment figures. But then you’ve got a part of your base that is wildly unhappy with you. I guess they either leave or just become pains in your asses for the rest of time. I’m not sure I’m on a team. I’m agnostic. natesilver: Voters (maybe not voters in the GOP, but voters overall) are already moving left on immigration. The reaction to Trump has been fairly thermostatic, as the political scientists like to say. micah: What does thermostatic mean? natesilver: Public opinion tends to move in the opposite direction of the president’s policy preferences. perry: But while I don’t think the Republican Party will change in the short term, I don’t rule out a strong third-party candidate doing well in 2020. There is some broad dissatisfaction with American politics that someone could capitalize on. Someone more like Oprah than Kasich, but I think it won’t be either one of them. I don’t know who that person is. micah: OK, I’ll say this: Partisanship is sooooooo strong now that maybe it allows for more ideological/policy movement and flexibility. We’ve seen Democrats and Republicans flip on the FBI. We’ve seen Republicans flip on free trade, Russia and Putin. So, in that sense, maybe it’s easier to imagine the GOP becoming more to Brooks’ liking pretty quickly. If, in three years, a set of circumstances comes together so that the “right” set of partisan positions for Republicans is Brooks-ian, I don’t really have much doubt that partisan voters would support those positions — in the same way Republicans became anti-free-trade almost overnight. clare.malone: I’ll buy that somewhat. The FBI thing is really interesting. A good point. perry: That’s a good ending point, I basically agree with Micah’s take there. natesilver: Yeah, I hate to say it, but I basically agree with Micah too. The very intense partisanship we see in the country today is a sign that the parties are quite healthy, whether or not it’s good for democracy. Let me just marinate in this moment for a little while.